Human lives with a smart, bored, always hungry two year old Border Collie. Human lives with a smart, bored, always hungry two-year old Border Collie. 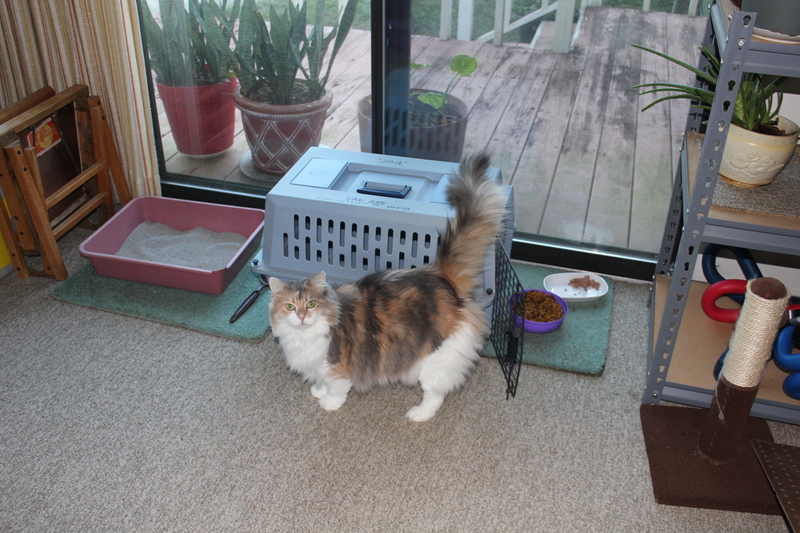 Human’s house has a sun room where Cat’s gourmet food is served. 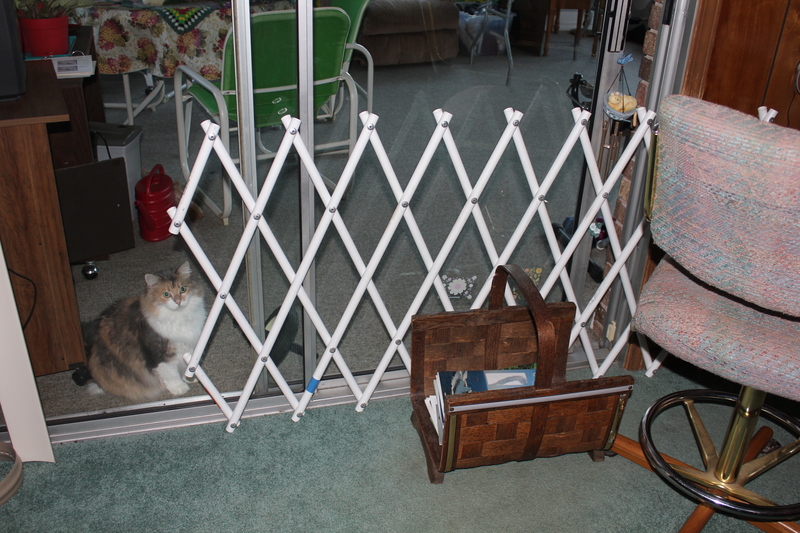 The entrance to the sun room has a sliding glass door that is partially open but is blocked by a PVC dog show ring gate and a magazine basket. The stage is set for the daily contest: Border Collie versus Human. 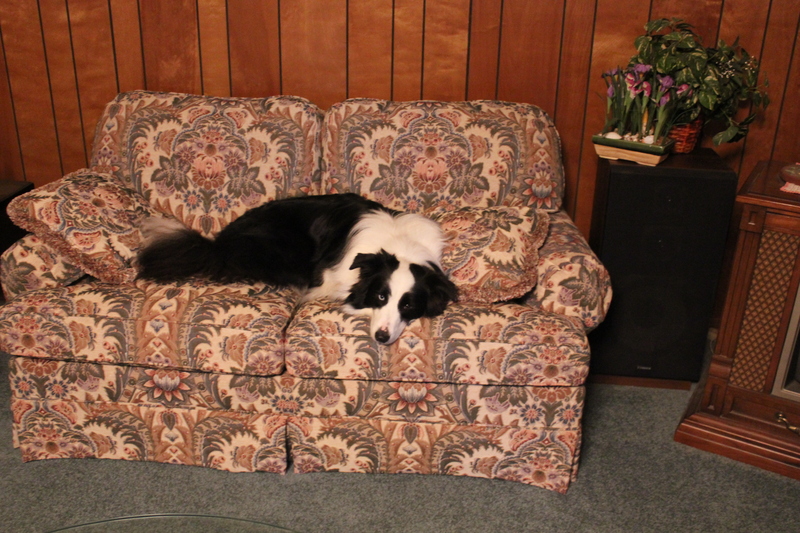 Border Collie stretches out on the sofa in the living room, waiting for Human to potty needy puppy. Time is on Border Collie’s side. He is an opportunist. He knows the Human is busy and can’t remember to close sliding glass door every time before taking needy puppy outside. Sure enough Human hears puppy whining and takes her quickly outside. Border Collie leaps from sofa. He uses his nose to push the PVC gate and magazine basket aside. He easily uses his nose to push the sliding glass door open. Sliding glass door was installed incorrectly. A stick to keep it partially closed won’t work. Border Collie silently praises sloppy contractor as he races to the Cat’s food. Human stands outside on the deck in front of the other sliding glass door, yelling at Border Collie to, “Leave it”. Human is hobbyist dog trainer but Border Collie is smart. Score is now Border Collie 3, Human 0. Human runs inside and says, “No, no, bad dog” to Border Collie. Border Collie licks his chops and burps. Goes to sofa and relaxes until tomorrow’s game. Human spends the rest of the day making the obstacles harder, deeper and scarier for the Border Collie. Human puts Cat’s food in a tiny crate. But each day the Border Collie watches the Human’s moves like a seasoned chess player. Each day, check mate. “Burp! Slurp!” Human thinks Border Collie is becoming smug. Cat is fat so she can’t climb up high for her food. Human has thought of that. Human has thought of always keeping the sliding glass door closed but Cat meows sadly on the other side. Cat needs food. Cat needs company. Cat needs to give the evil eye to Border Collie. Human is not afraid to cheat by using the Internet to ask for help. Human is too embarrassed to go on dog training websites and ask for answer to age-old question. How do you outwit a Border Collie. So Human asks you. Help. Advice needed. Cat hungry. Border Collie still licking chops. Human is frustrated. This entry was posted in border collies, Dog training, Dogs and tagged Border Collie, Border Collies, Dog, Dog training, Pets. Bookmark the permalink.